Now, getting into the spirit of Christmas is a little harder for me living on the coast of Oregon. We’re in a temperate rain forest here, and right up against the cold Pacific Ocean, so our weather is very moderate. Our highs and lows are often the same number in the winter, and that’s somewhere in the 40s. Heck, in the summer our highs and lows only vary by a few degrees, too, from the high 50s to low 60s. My point is, not a whole lot of seasonal variety around here. It’s pretty much either the rainy season (November to June) or the mostly dry season (July to October). The hardest part for me is the lack of crisp, cold weather and, especially, snow. I love snow. Snow is magical (I mean, unless you’re trapped in it, of course). And Christmas snow is the most magical of all. We didn’t always get Christmas snow growing up in Jersey. But there was always hope. Same with Missouri, where I went to grad school. And Christmas snow was guaranteed when I lived in Summit County, Colorado. But here, not a snowball’s chance in…well, you get the idea. Still, I hope. And if it snows anytime in the month of December, I revel in it. This year, that hope paid off, and I got my Christmas miracle: an inch of snow on the beach last week. It might just be a coincidence, but I believe Kerrie L. Hughes is responsible for my magical happiness. Because our offices are filled with notes of magick right now (Kerrie spells it with a k) thanks to our latest volume of Fiction River, Hex in the City. Urban fantasy offers a diverse playground for some extremely powerful stories. Professional writer and editor Kerrie L. Hughes pulled some fantastic tales out of fourteen top writers for this fifth installment of Fiction River. 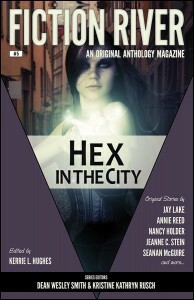 Set in urban lands from modern Portland to a future Detroit to a wild Washington, D.C., and ending the tour in London, these top writers take the idea of “hex” and stretch and twist it into stories with a magical grip on the imagination. Heck, even the Grinch would appreciate this kind of Christmas magic. And while we’re talking about Fiction River, we’re already deep into Year Two around here, and we’ve recently released the covers, editors and titles for those seven volumes. So, check out what’s coming. A subscription to Fiction River truly is the gift that keeps on giving.